You wouldn’t visit Paris and not climb the Eiffel Tower, would you? Or make the trip to New York and not stand atop the Empire State Building. So why would you visit Sydney – or even live in Sydney – and not climb the world famous, instantly recognisable Sydney Harbour Bridge? You might argue that you’d like to climb the Sydney Opera House, too, which is just as – if not more – famous. The problem there is that you’d be arrested. Just like you would’ve been had you climbed the Coathanger prior to 1998, when BridgeClimb was opened. Quite apart from the fact that you can tell everyone you’ve climbed the Harbour Bridge, the act in itself is highly rewarding. The view is fantastic, the climb is tremendously safe, not too taxing, and highly informative. You can climb the bridge at most times of the day (and night), but the best time to do so is in the late afternoon in daylight, and come down as Sydney’s lights come on. When the Harbour Bridge opened on March 19, 1932, the initial toll for a car was six pence (five cents), and a horse and rider was three pence (two cents). Since BridgeClimb was officially opened on October 1, 1998, more than 1.5 million people have climbed the world’s largest steel arch bridge. Also, if you’ve got a thing about heights, it’s actually pretty cool (and cheaper) to simply walk over the bridge on the footpath. 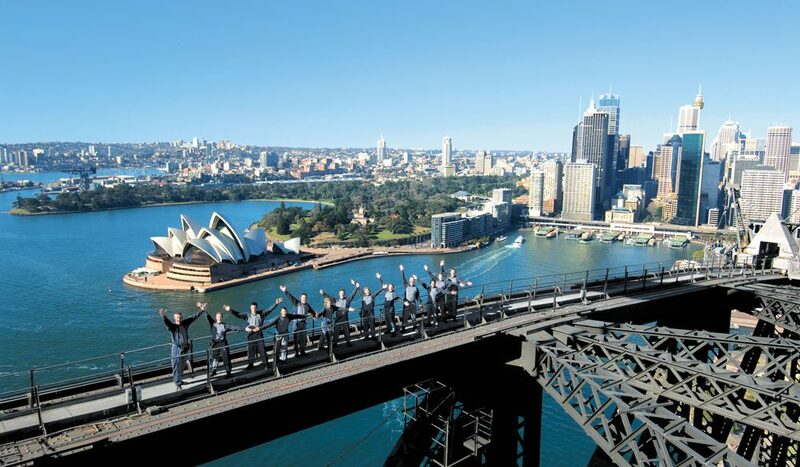 BridgeClimb is a 3.5-hour adventure to the summit of the Sydney Harbour Bridge. Experience unrivalled 360-degree views of Sydney whilst suspended over the world-famous Harbour. Experience the excitement of a Day Climb as the city whizzes beneath your feet and the views enchant you. Breathtaking Twilight Climbs allow climbers to experience the transition of this cosmopolitan city from day to night, while Night Climbers set out on their adventure under a blanket of stars. Exclusive Dawn Climbs, running once a month, also allows Climbers to welcome in the new day as light breaks over the East Coast. The entrance to Bridgeclimb is on Cumberland Street, in the Rocks area of Sydney. ** This is our original 100 Things to Do Before You Die. First published in 1996. There is an updated 100 Things To Do In Australia Before you die, published in 2011.